Welcome to Clarion, Iowa. We want you enjoy your visit and hope perhaps you'll want to stay. Activities in Clarion range from a visit to the Heartland Museum to a day on the lake. How about a round of golf at the Clarmond Country Club & Golf Course, a movie at the Clarion Theatre or perhaps a refreshing swim at the Aquatic Fun Center is more your style. The Clarion Library can help you find the reference material for that last minute presentation or choose a good book, kick back, and relax. It's all up to you, there is always something to do in Clarion. Try one of the many premiere restaurants Clarion has to offer. Traditional American menu's are available or you can indulge in a Chinese or Mexican Restaurant for savory meals. If fast food is what you are looking for order a pizza and have it delivered or drive thru and pick up a burger. Several area restaurants offer a delicious menu of Steaks, Chicken, Sandwiches, Appetizers and Daily Specials. Clarion is proud of its manufacturing innovations and agricultural origins... An outstanding history of family farms and the world's largest producer of eggs. Clarion is where industry, agriculture, and vibrant shopping combine to provide excellent jobs and a wide variety of goods and services. Add to this a world-class hospital, a quality school system, and central access to the rest of the state makes Clarion the place where your business and family can grow. Take a look at our city, our events and the many entertainment venues and you'll agree. 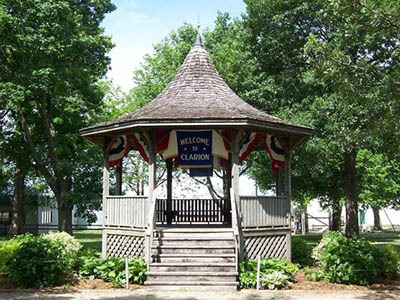 . . Clarion is the place to be.